Because it is very iteresting and I wish to tell about Mail-Art to those who lives in my city and in my country. 2015, announced as a year of literature in Russia, will go under the sign of the “Big Read”. The large-scale international project that plunges the whole cities into a one familiar literary work, will also step on the lands of Togliatti. 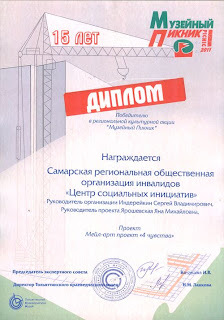 (took place at 22nd May in Togliatti). An exghibition of mail-art project "4 Senses" will be at Museum Picnic at 22nd May 2011. Nonprofit institution of disabled people of Samara region "The Center of Social Initiatives" invites you to participate in mail-art project. The topic is "4 Senses". Usually one have 5 base sensations: visual, auditory, tactile, gustatory and sense of smell. visual sensation is critical because it gives majority of infor…mation about environment. wishing you the happiest of birthdays and many happy mailings! Моё послание вроде как у вас в отделении связи уже. Hey Yana, nice to meet you - hope you going to do the book on Alexander - nobody from your part of the world yet?